Isiah Andrew, 8 years old, may be one of the youngest to survive the dreadful flash floods that swept hundreds of homes away, leaving 17 dead, 30 missing and an estimated 12,000 people homeless as of yesterday. Isiah lives with his parents in Wagina, a settlement in Choiseul province. 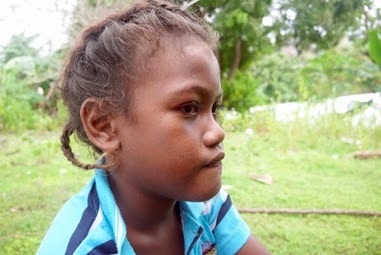 A week before the floods, he came to Honiara to spend his one week school break with his sister as he always does. But little did he know, this holiday would be a haunting one for the rest of his life. His sister lives with her husband’s family 3-4 kilometres upstream from the Matanikau River bank. In the afternoon of the 3rd of April, Isiah said he was sitting on a ladder into the river when all of a sudden the water level increased. Isiah who is still in shock said everything happened so fast that the next thing he remembered was holding on tightly to a coconut tree trunk with the flood rising rapidly around him. An eye witness who has a house a few meters inland on high ground said that as much as they wanted to help the boy, they could not rescue him because the flood came in very fast and rose very rapidly. Isiah explained he felt helpless and for the very first time in his life felt alone and afraid as he was being cruelly tossed by the flood rage. When Isiah came up to catch his breath he was surprised to see that the water was level with the old bridge. The flood was so severe that when he came up for air the second time he was under the new bridge. He then swam towards a log and drifted out to sea. After floating for several hours on the log, out at sea, a fishing boat came to his rescue. Later that day Isiah found out that three of his younger nieces and nephew, together with their grandfather were still missing. Today their bodies have been recovered and families and friends have gathered to provide support and comfort. Brave Isiah said that he would have traded his life for his little nieces and nephew, describing how much he will miss them. All that is left of the family’s house which was built with modern material is its cement foundation. Survivors of his family are taking refuge at their relative’s home. 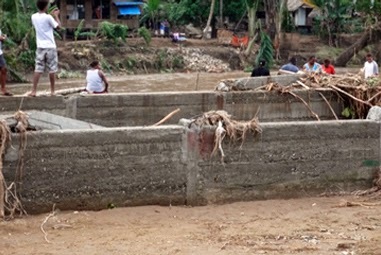 Honiara Township and the whole of Guadalcanal was declared a disaster area by the Minister of Environment, Climate Change, Disaster Management and Meteorology. Food, water clothing and cooking utensils are urgently needed in the evacuation centres. Relief efforts are currently underway. UNICEF is supporting the Government of Solomon Islands to respond to the pressing needs of more than 50,000 people, of which about 24,000 are children, affected by the flash flooding on 3-5 April 2014. More than 12,000 people are camping in evacuation centres and are in need of shelter, food, water, clean sanitation facilities, health care and stress counselling. Schools were also damaged or are in use as evacuation centres, and UNICEF aims to help to bring children back to school and normalcy as soon as possible.